At July’s Pure Origin sourcing and manufacturing show at London Olympia, denim, fabric trends and innovation will take centre stage. A new dedicated Denim area will showcase a host of leading denim industry brand and create a focus on the denim industry and the alternative ways to make denim more sustainable, from new materials through to new processes being developed to help reduce water wastage. The show also launches a new Fabric Trend area spotlighting future trends and innovations creating in collaboration with Coloro and WGSN. Soko Chimica, an Italian chemical production company also exhibiting in the Denim area, is driving change in denim production processes, constantly researching sustainable and innovative solutions to reduce the pollution that the denim industry causes. Caleage Ltd/ Les Ateliers Creatifs de l’Ocean Indien Ltee (India) amongst others. Innovation in the denim sector continues through to the Origin Stage, an educational conference area to discover and be inspired by the latest developments in the sourcing world. 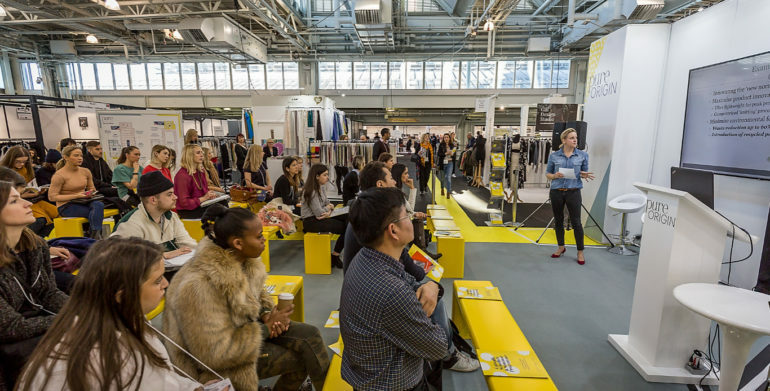 Leading industry experts will present trends and forecast the future of textiles, delve into sustainable supply chains, discuss innovation in materials and fabrics. Bert Van Son, CEO of MUD Jeans will discuss the innovative business model of DENIM at 12:30 on 24th July. Also new for July 18 is the Fabric Trends area. Working closely with both Coloro and WGSN to identify the key colours and trends for Autumn/Winter 19/20, Pure Origin fabric exhibitors will be selected to display and showcase the latest fabrics and create a tactile and interactive onsite experience. Visitors will also be able to discover the latest thermal insulation technology from Thermore® including Bluesign® approved 100% recycled products such as Ecodown®. This product offers exceptional warmth, softness and durability and takes the next steps toward sustainability by saving up to 10 plastic bottles per garment. Pure Origin is also proud to announce that EDB Mauritius will be leading a delegation of 14 textile and apparel companies to participate for the first time in London. Exports from Mauritius to the UK amounts to some £177 million while gross direct investment from UK has reached £11 million. Amongst the products that are being exported, Textile and Apparel top the list with domestic exports amounting to £107 million which includes a wide range of products such as T-shirts, shirts, pullovers & cardigans, babywear, swimwear, athleisurewear and lingerie. Pure Origin, from 22nd – 24th July at London Olympia, takes place alongside Pure London and Pure Man, creating London’s largest festival of fashion.